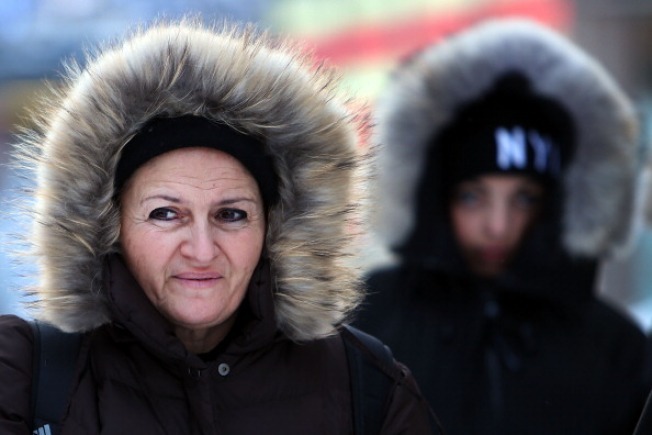 This week's freezing temps will likely be joined by a snowstorm at the end of this week. A major storm is headed to the D.C. area, with Storm Team4 warning that we can expect at least a foot of snow. But there's still time to prepare. Stay indoors if possible. If you must go outdoors, officials urge you dress warmly and wear loose-fitting, layered, lightweight clothing. Wear a scarf over your mouth to protect your lungs. Watch for signs of hypothermia, including uncontrollable shivering, weak pulse, disorientation, incoherence and drowsiness, and frostbite, including gray, white or yellow skin discoloration, numbness and waxy-feeling skin. To prevent frozen pipes, State Farm suggests letting your hot and cold faucets drip overnight and open cabinet doors to allow heat to get to uninsulated pipes under sinks on exterior walls. Find the water shut-off valve in your home in advance of a water emergency, so you know where to go if a pipe bursts, D.C. Water spokesperson Pamela Mooring advised. If you' are going away for an extended period of time, be sure to maintain adequate heat inside your home at no lower than 55 degrees. Do not place a space heater within three feet of anything combustible. Go ahead and program your local utility contact information into your cell phone now, before you need them. If your car battery is three years old or older, it is more likely to fail as temperatures drops,according to AAA. Never attempt to charge or jump-start a battery that is frozen, as it may rupture or explode. Wintry weather can contribute to the deterioration of your windshield wipers. Worn blades streak and impair vision, which is critical during winter months. AAA says wiper blades should be replaced every year. Keep your washer fluid topped off with winter formula fluid so it won't freeze. Many of your car's fluids should be checked once a month. The ASPCA suggests wiping your dogs' legs, feet and abdomens when they come in from snowy or icy conditions. Dogs can ingest salt, antifreeze and other chemicals when licking their paws. The Fairfax County Animal Shelter is also offering temporary housing from the cold for cats, dogs or small companion animals. If you or someone you know needs to use this service, call the shelter at 703-324-0208. Open Friday, Jan. 22 and Saturday, Jan. 23. Open 8 a.m. to 4:30 p.m.
Brooke Evans contributed to this report. Download our NEW free weather apps for iPad and iPhone. You can also follow us on Twitter andFacebook, and sign up for our e-mail newsletters.